Bellwood is nestled amongst the walnut trees of the city of Modesto, Bellwood is unlike the more typical self-contained Levitt communities. The homes and streets of Bellwood are well intergrated with the overall grid pattern of Modesto, giving it an appeal of older, more established communities in character with adjoining neighborhoods of Modesto. M O D E S T O , C A . Location: City of Modesto, Ca. Constructed by Levitt and Sons, Inc. as Levitt and Sons of California, Inc.
Open for sales in 197x. Official web site for the City of Modesto--the city of "Water, Wealth, Conentment, Health." View the Front and Back Covers of the brochure. View the Community Profile for your exciting new home "nestled among walnut trees" at Bellwood. View the Prices, Standard Features, and Optional Items available for your new home here at Bellwood. Tour all three sample homes and select the style of your new home in Bellwood. Each single-level three- or four-bedroom home is available in three exteriors, and each has two full baths and a two-car garage. Rancher. 3 Bedrooms, 2 Baths, Covered Entry, Ceramic Tile Entry Foyer with spacious Guest Closet, Sunken Rear Living Room with Gas Fireplace and Optional Sliders to back lawn, Formal Dining Room overlooking Living Room, Kitchen with Pantry, Family Room with Sliders to back lawn and Optional Gas Fireplace, Generous Hallway Linen Closet, Master Bedroom Suite with Sitting Area, separate Vanity and Bath Areas, Walk-in Closet with Pocket Door, and Optional Sliders to back lawn, 2-car Garage with separate Laundry and Utility Areas and Service Door to side lawn, Fully Fenced Rear Yard. Rancher. 4 Bedrooms, 2 Baths, Ceramic Tile Entry Foyer with oversized Guest Closet, Rear Living Room with Gas Fireplace and Optional Sliders to back lawn, Adjoining Dining Room with Bay Window and Cathedral Ceiling, Family Room accessible from Living Room and Kitchen with Sliders to side lawn, Master Bedroom Suite with separate Vanity and Bath Areas, and two Closets, Laundry Room off Family Room, 2-car Garage with separate Utility Area and Service Door to side lawn, Fully Fenced Rear Yard. Rancher. 4 Bedrooms, 2 Baths, Covered Entry, Ceramic Tile Entry Foyer, Living Room with Gas Fireplace, Formal Dining Room open to Living Room, Kitchen with Breakfast Bar open to Family Room, Rear Family Room with Sliders to back lawn and Optional Gas Fireplace, Master Bedroom Suite with Double-door Entry, Cathedral Ceiling, Walk-in Closet, separate Vanity and Bath Areas, and Optional Sliders to back lawn, Optional Den with Wet Bar in place of Bedroom 4, Laundry Room adjacent to Bedrooms with Garage access, Oversized 2-car Garage with Utility Area and Service Door to side lawn, Fully Fenced Rear Yard. 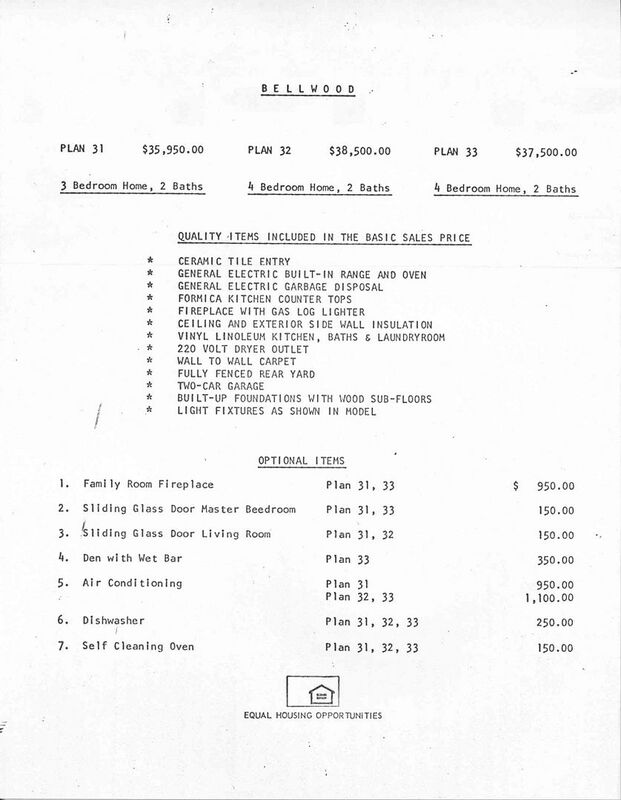 Note that certain items that are usually standard equipment in typical Levitt homes--namely the Washer, Dryer, Dishwasher, and Central Air Conditioning--were NOT part of the purchase price. Interestingly enough, it would appear from the options list that the Washer and Dryer were not even available for purchase from Levitt and Sons of California. This difference may reflect typical trends in the northern California region. Note other interesting items that may also reflect local trends, such as fully fenced rear yards and the fact that the models were numbered rather than named. 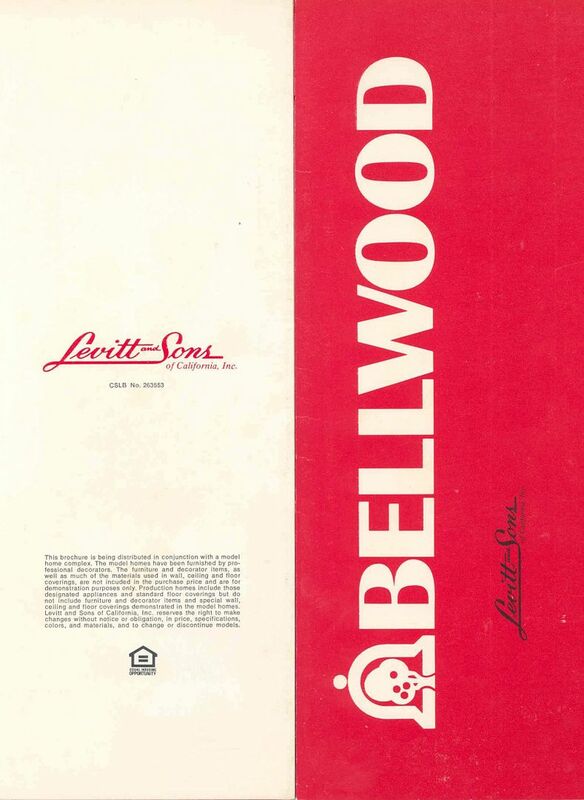 The homes in Bellwood were were built on foundations with crawl space under, rather than on reinforced concrete slab as would be more typical when Levitt built homes without basements. Page last revised Aug. 13, 2007.